John Ameroso didn’t hoe the rows of vegetables that help feed the Bronx at the Padre Plaza Success Garden in the borough’s Mott Haven section. He didn’t pick any tomatoes from the vines at the Brooklyn Rescue Mission’s farm. And he didn’t turn the composting bins that kept East New York Farms! fertile ground for collards, cilantro and chard. But he’s responsible for all of it, along with the rest of more than 18 tons of produce grown in city lots for market last year. You have most likely never heard of Mr. Ameroso. 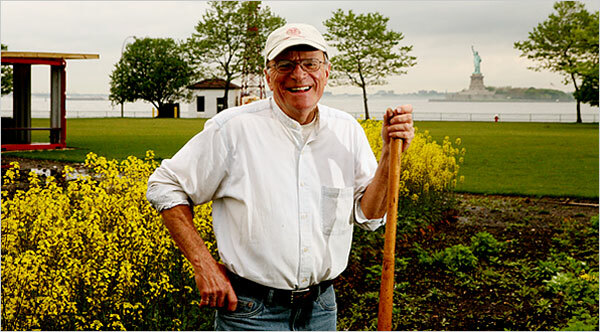 Yet from a rubble-strewn vacant lot in Brooklyn where he showed New Yorkers how to grow food in 1976 to a three-acre stretch of Governors Island that he’s helping to sow now, he has been behind nearly every organized attempt to grow and sell food in the city, as well as many of the city’s best-known food organizations. He was New York City’s first extension agent focused on farming, and now probably its last one. Mr. Ameroso formally retired in March and will spend the 2010 growing season removing himself from the daily work of city farms and making sure his colleagues — many of whom he’s trained — can carry on without him. Mr. Ameroso’s work, as a Cornell University Cooperative Extension agent, started in 1976, when Representative Fred Richmond, Democrat of Brooklyn, — a gardening enthusiast who’d installed a vegetable plot outside his Capitol Hill office — got money for an extension office in New York City, to show that urban food gardens could help feed inner-city neighborhoods. By 1994, the project, called the Urban Gardening Program, had expanded to 23 cities and was producing $16 million worth of food each year. Its progeny have continued in all five boroughs. On Decatur Street in Bedford-Stuyvesant, the Brooklyn Rescue Mission’s managers were recently looking for help transplanting a fig tree. “We’ve got to move this,” said the Rev. DeVanie Jackson, gesturing at the potted sapling. “You’ve got to recommend a spot.” Ms. Jackson and her husband, Robert, have enlisted Mr. Ameroso’s help since 2005, when they began growing vegetables to make up for the poor quality of food being delivered to their food pantry. By last year, they were supplying the neighborhood’s weekly farmers’ market (which they helped found) and an upscale pizza spot, Saraghina, with herbs, vegetables and figs. “Which way is your sun going?” asked Mr. Ameroso reproachfully. “It goes that way,” he said, drawing an arc tracing the sun’s likely path through the sky. The best location would be wherever the tree would get the most light — something Mr. Ameroso clearly thought should have been obvious. “How long have you been here?” he asked. Ms. Jackson laughed, and asked his advice on handling slugs. She’d heard she could put out a pan of beer, which would attract and then drown the pests. Ms. Jackson raised her eyebrows. “I’m not making it up!” he said. In Far Rockaway, Queens, Mr. Ameroso and his colleague, Robert Lewis, special assistant for market development of New York State’s Department of Agriculture and Markets, pulled up to the Culinary Kids Urban Farm at Beach 31st Street and Seagirt Avenue. The corner lot held urban farming paraphernalia: a rounded greenhouse, a narrow chicken coop, wood-framed vegetable beds. But what caught Mr. Ameroso’s attention was a crew of volunteers building a roofed structure. His response to frippery like gazebos isn’t surprising, given his rugged training grounds. The son of a welder and supermarket cashier, Mr. Ameroso has spent little time in tranquil settings since getting an agricultural degree from the University of Georgia in 1968. After college he worked for the International Voluntary Service teaching farmers to grow hybrid rice in the Mekong Delta during the war. Returning to the States in 1972, he took odd jobs for four years until he went to work in Brooklyn. Growing food was always what Mr. Ameroso cared about, though beautification efforts would insinuate themselves. “To me the exciting stuff was, people are producing food to produce it, not, ‘Oh, look at how pretty my flowers are,’ ” Mr. Ameroso said, trundling along the Gowanus Expressway in his two-tone Ford Ranger pickup to a farm he helps manage in Staten Island. In 1994, federal money for New York’s urban food production dropped by 80 percent, forcing the extension to cobble together a salary line for Mr. Ameroso from various projects. To qualify for economic development money he began growing food for sale, an impetus to New York’s contemporary food movement. Mr. Ameroso and a group of other food activists — Mr. Lewis, Peter Mann, Kathy Lawrence and Joan Gussow — embarked on project after project, while Mr. Ameroso handled the dirty business of actually growing food. In 1995, they helped found Just Food, a nonprofit group that now offers technical assistance to urban growers and cooking and nutrition education, and is an advocate for the use of local food. Mr. Ameroso still sits on its board and helped start its first big program, City Farms. Then came the New Farmer Development Project, in 2000, to find land upstate for farmers from the city. In the early 2000s, he helped found the city’s two largest urban farm projects, East New York Farms! and Added Value. Now that Mr. Ameroso is retiring, what will the city’s farmers do without him? Cornell will probably transfer some of Mr. Ameroso’s duties to other agents, said Don Tobias, executive director of the cooperative extension in New York City. And Mr. Ameroso may consult on a part-time basis. Without a program or funding line dedicated to urban agriculture, however, the era when one phone call could bring time-tested food-growing advice to your doorstep may be ending. But Mr. Ameroso has trained a steady stream of interns, who today help run urban agriculture efforts across the country. (He’s married to one of his first interns, Linda.) And with Mr. Ameroso’s help, Just Food’s City Farms program has trained 29 gardeners as urban agriculture experts so they can operate as an informal extension office. Mr. Ameroso hopes that will be enough to let them continue without him. The farmers aren’t so sure.